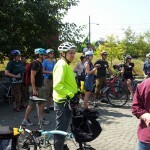 The other week some of us with Central Seattle Greenways went down to Portland to see their neighborhood greenways in action. 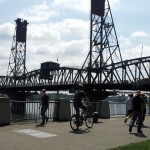 We had a chance to meet with representatives from many of the groups that have been active in creating a bike and pedestrian friendly city, including the Portland Bureau of Transportation (PBOT), Alta Planning & Design, Friends of Trees, and the Urban Greenspaces Institute. 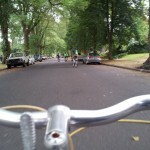 While we can’t copy/paste their strategy from Portland into Seattle, we did have over 40 miles on our bikes to reflect on what could work and what might not translate well to our city and here in Central Seattle. The biggest take away from the trip is that with not much intervention, we can dramatically change the feel of moving through the neighborhood. 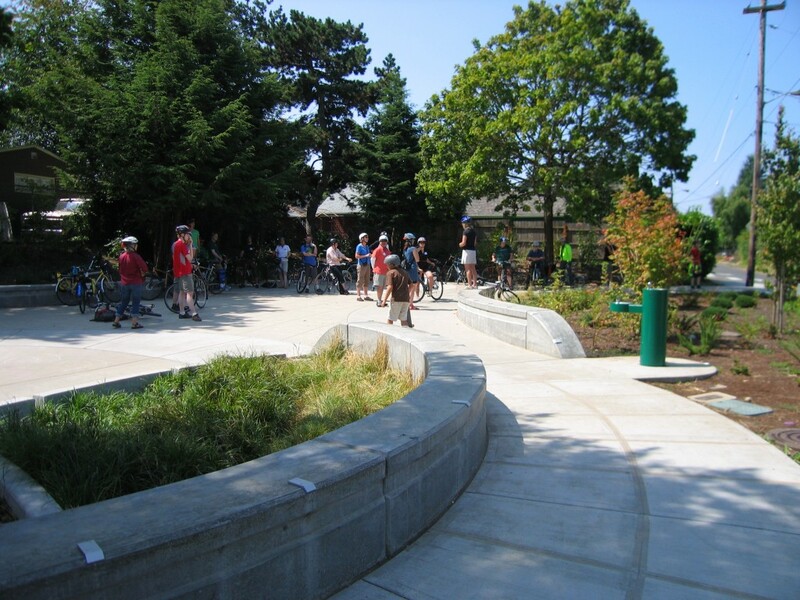 Greenways in Portland involve modest changes that are inexpensive to do, but end up creating safer and more effective streets for bikes and pedestrians. 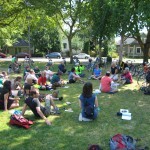 Their recipe for a neighborhood greenway is relatively simple. First, you start with a low volume residential street with ideally less than 500 cars per day (and no more than 1,000). 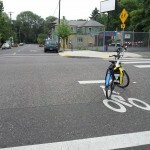 Next, you make the street easy to bike on by reduce the number of stops along the route as much as possible. This generally means flipping some stop signs so that they face away from the route and means that when you are on your bike, you can keep momentum up and conserve energy (which is important if you are biking with kids). While that is great, the problem is that it also makes for a nice straightaway for cars as well. 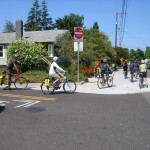 Without any other changes to the street, cars will take advantage of wide open streets and no stop signs, which goes against the mission of greenways in general and puts everyone who uses the street at higher risk. Speed on our residential streets matters. A five mile per hour difference dramatically changes the odds of someone who is hit by a car surviving. The only person who benefits from fast moving traffic on residential streets is the person behind the wheel, and even then their benefit is measured in seconds. 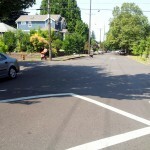 Since speed is so deeply connected with safety and because wide open streets attract more drivers, PBOT has used two techniques to mitigate the jump in speed and traffic volumes that come with changing the stop signs on a street to be more bicycle friendly. 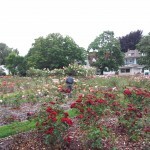 The biggest traffic maintainer we saw was actually a park. There is a path just to the right where bicycles can pass, but cars cannot. Most maintainers are just concrete refuge islands at busy intersections. The first is to install traffic maintainers periodically through the route to encourage drivers to stay on local arterials instead of on the residential streets. The maintainer is a concrete barrier the prevents car traffic from easily driving long distances on a residential street. They break up the distance that cars can comfortably travel, which means that the traffic volumes don’t go up from people looking for a new way to cut through the neighborhood and people who live in the neighborhood still have the exact same access to their streets as before. A worst case scenario is that someone might have to drive three extra block lengths because they no longer can make a left turn off of an arterial. At the same time, these maintainers allow bikes to pass through and continue along the greenway. Can you spot the speed hump in the picture? 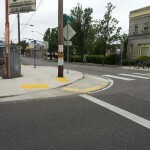 The second is the use of speed humps. These are completely different from the speed bumps you find on arterials here in Seattle or the jarring speed bumps that you find in parking lots. These fourteen feet long and whole street wide humps are hardly noticeable to people in a car who are driving at residential speeds (20 mph) . The rise and fall is much more gradual and because you are on a residential street to begin with, you do not need to hit the brakes to slow down like you do on the arterials here in Seattle. 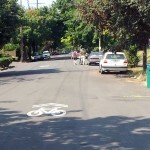 For bikes, the speed humps are even less of a concern. These are used where needed and where wanted by the community, but the combination works for them. 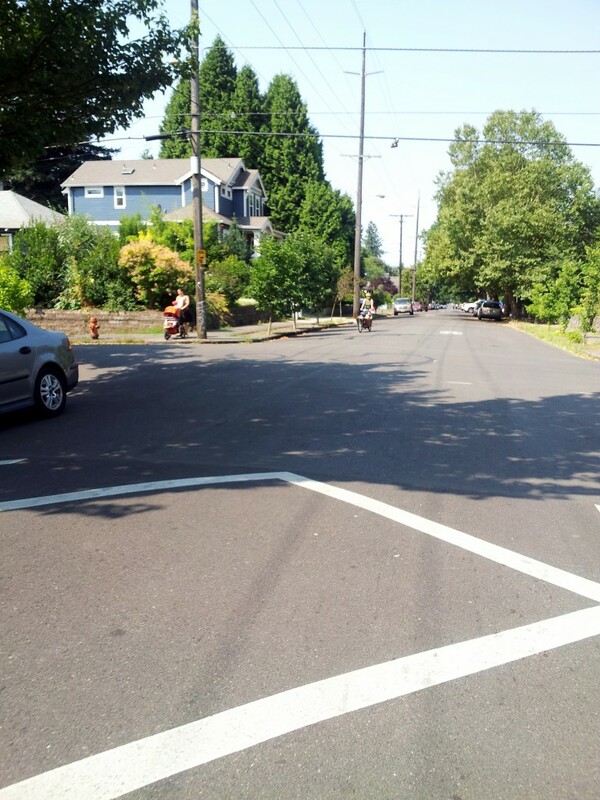 They make the street safer for people of all abilities while strengthening the role of that street as a neighborhood street, free of drivers who mistake it for an arterial. That’s part of the reason why we saw more scenes like the one above while we were there. 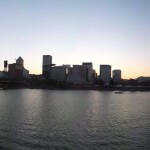 Another important part is that Portland has done a great job creating a system that is easy to understand and follow. 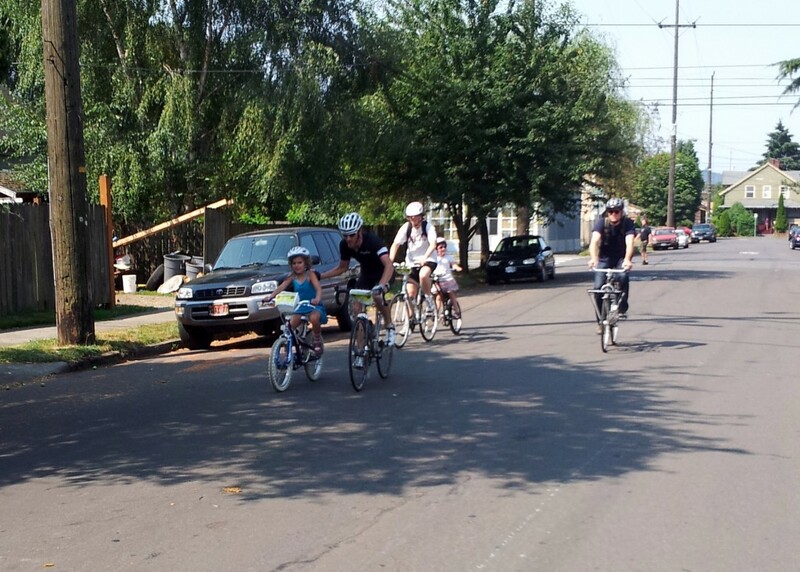 The city is rolling out with what they call “toppers” to show that a street is a greenway, as seen below. 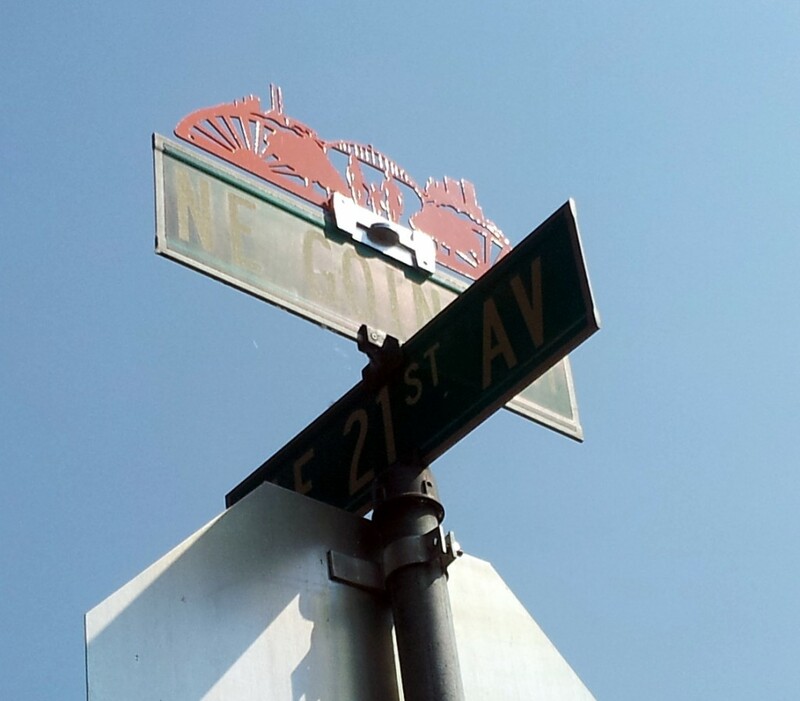 These are simple metal cut outs that have been put on top of the street signs, adding color and art to the streetscape. A “topper” on the Going Street Neighborhood Greenway. 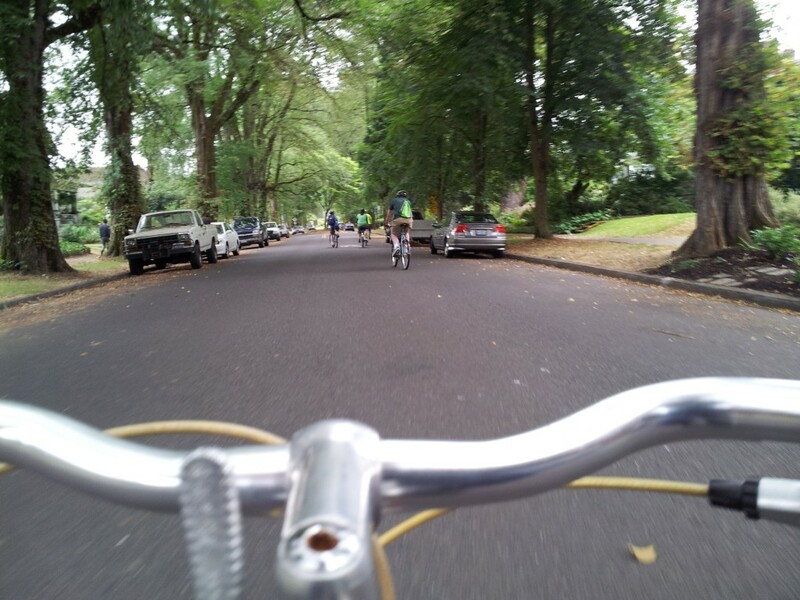 Portland was a great chance to see that neighborhood greenways work. The engineering solutions that they used work for them, but the key difference between Seattle and Portland is that Portland made a choice to pursue safe neighborhoods. The community health aspects of additional cyclists, more people walking to the store, and more opportunities to bike as a family were side effects of what they needed to do to achieve that safety goal. 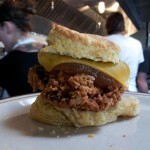 The real question here in Seattle is whether we want to make that same choice. 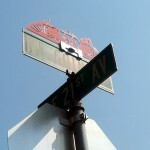 We know what the major risk factors are on a neighborhood street. How safe do we want our streets to be and how much safety are we willing to trade for speed on the streets in front of where we live? 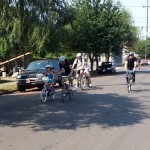 If we decide that returning to the type of neighborhood street where a child could learn to ride a bike (or an adult would feel comfortable getting back on one) is a priority, then Portland is a good case study for the type of street we can strive for and what we can accomplish with a modest budget. My worry is that parents are being encouraged to send small kids out onto the streets riding bikes that are not separated from traffic sufficiently. In many places in Europe there are bike paths separated from car traffic by a parking lane. So the layout is; sidewalk … curb …. 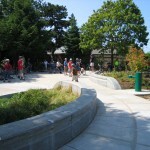 bike path …. parking curb and parking lane for cars …. 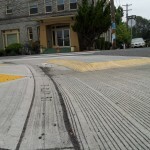 traffic lane for cars in center of roadway. One advantage of this layout is that bike traffic is not exposed to the danger of opening car doors as frequently because the driver’s side door opens to the car traffic lane not the bike lane. AND bikers are separated from cars more completely.